Don Randell (b. 1924) moved from Port Rexton and joined the St. John’s music scene in 1941. An accomplished player equally at home with the popular dance band repertoire, country music and old-time fiddle tunes, his name became synonymous with fiddling in Newfoundland through regular appearances on VONF (with “Ralph and Don”, VOCM (with the Happy Valley Gang) and CJON-TV as a member of the country group the Dipsydoodlers. He was part of the original cast of “Saturday Nite Jamboree” on CBN and “All Around the Circle” on CBC-TV. Don is a winner of the Newfoundland and Labrador Arts Council Hall of Honor Award (1997), and the “Stompin’ Tom Connors” award from the East Coast Music Association. An old-time fiddler (sometimes tagged as “The Don Messer of Newfoundland”) and also proficient on the guitar, mandolin and string bass, Ted Blanchard (b. 1929) moved to St. John’s in 1951 where he played in a number of groups including the Happy Valley Gang. He was a seasoned radio performer by the time he joined “Saturday Nite Jamboree” on CBN. He was also a permanent member of the “All Around the Circle” band. A labour mediator, Ted served a term as Minister of Labour in the government of Brian Peckford. He still plays the fiddle, and can be seen wherever bluegrass music is performed. 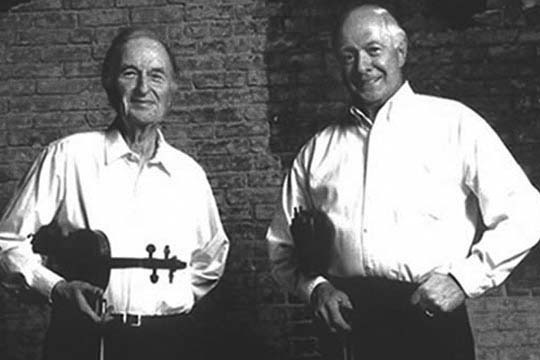 Don and Ted released the first ever commercial recording of Newfoundland fiddle music under the name, The Shamrocks, in 1957. They have both played fiddle with bluegrass band Crooked Stovepipe.